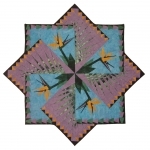 These quilts were created for special occasions or contests. 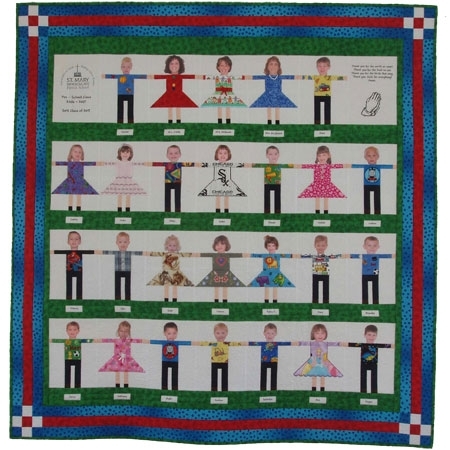 This quilt was made for my younger son's pre-school class as a silent auction fundraiser. I took head-shots of all of the children and dressed them in their favorite themed fabrics. It raised over $600 for the school. Sadly, we moved the following year. What I wouldn't do to get the quilt back! My first contest quilt. Took an Honorable mention in my guild's quilt challenge in 2004. This quilt travelled with the 2004 Hoffman Challenge exhibit. 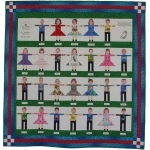 The quilt was created for the Pride of the Prairie Guild "Games Children Play" Challenge in 2005. It took a 2nd place ribbon. Being known only as a piecer, none of my fellow guild members guessed this quilt was mine! 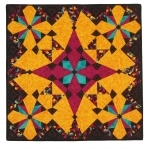 The top 8 vote getters from this challenge, including this quilt, were exhibited at the Ultimate Guild Challenge exhibit at the 2005 AQS Nashville Quilt Show. This quilt was made for my cousin Liina's wedding in Estonia. She married a wonderful Norwegian man who she met in South Africa! The center stripe pattern was drawn from her native Estonian folk costume skirt and the outer chain border represents the linking of two families from two countries. All of the wedding guests were invited to sign in the white chain areas. 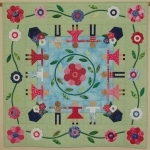 The story surrounding this quilt was featured in a blog by Chris Brown, the editor of American Quilter Magazine. For the story and more pictures, go to http://www.quiltviews.com/international-wedding-story. "90 Things we love about Peg, Mom, Grandmom, Mom-Mom" I made this quilt as a family birthday present when my husband's grandmother turned 90 in November 2010. 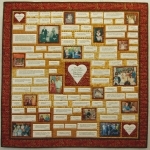 The quilt contains 90 quotes from all of the family members down to my children, the only 2 great-grandchildren. She proudly displayed the quilt in her independent living apartment until her passing on April 2, 2012. Grandmom was a most amazing lady who always had an open heart, an open mind, a keen wit and an unending supply of love (and good food!) for her family. We will miss her! This quilt won a 2nd place ribbon in my Quilt Guild's March 2012 quilt challenge. The Courthouse Quilters of Hunterdon County are hosting their 10th Quilt Show at the Prallsville Mills in Stockton, NJ this October 5-7. So the quilt had to contain "10" of something and have the colors red and tan to represent the mill buildings. 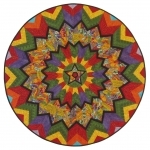 I chose to make 10 round Kaleidoscope images from 10 pictures I took at the 2008 show. The Kaleidoscopes were made withKaleidoscope Kreator 3 software from Kaleidoscope Collections. The shape was to represent the millstone (also found in the corners of the quilt). This is the mini I made for theAlzheimer's Art Quilt Initiative's "Priority Quilt Project". It will be sent to the programs's website for auction/sale to raise funds for Alzheimer's Research. It measures 8" x 10".